Running 26.2 miles—the length of a marathon—once or twice is an achievement. How about five marathons? Or even 30? That would be a total of 760 miles, or the driving distance between Kansas City and Detroit. 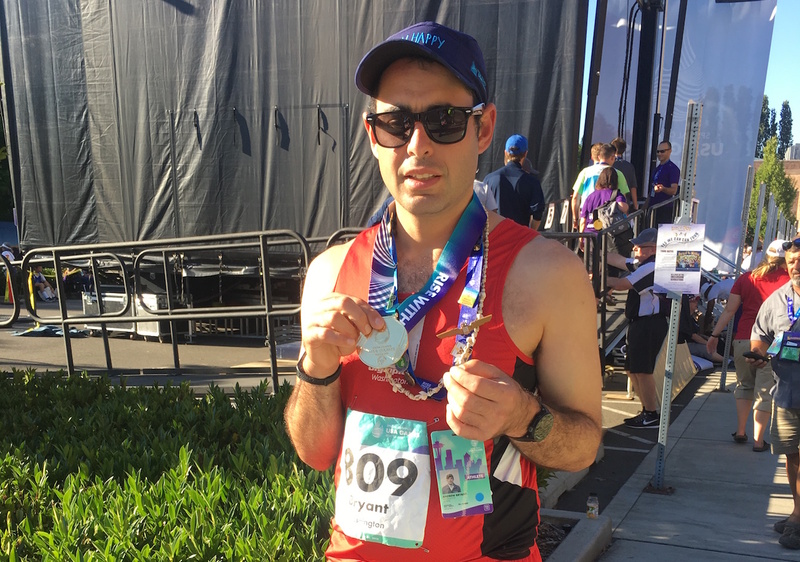 This is what 37-year-old marathoner Andy Bryant has accomplished over the past 19 years, but it is far from the biggest challenge he has overcome. Bryant was diagnosed with autism at the age of four. Doctors told his parents that it was unlikely he would ever be able to cross the street by himself, let alone live by himself. He has not let his diagnosis stop him, despite the numerous challenges he has encountered throughout his life. Four years ago, he became fully literate, and he currently lives with three roommates in Seattle and works at a restaurant on Microsoft’s campus. The first week in July, Bryant was one of 4,000 athletes who participated in the Special Olympics USA Games in Seattle. He won the 3,000-meter race with a time of 11:59.08 and placed third in the 10,000 meters with a time of 41:51.19. Bryant has been involved in Special Olympics, a worldwide movement that promotes inclusion for athletes with intellectual disabilities, since he was little. His first event was an assisted race walk—one lap around a track—and he got a medal for it. Then, in elementary school, he began skiing through a Special Olympics program that helped him manage his fear and focus. These were important steps in his journey to becoming a marathoner, as he needed to be comfortable running by himself. Bryant’s stepfather, Jerry, introduced him to running and later advocated for him to join his high school track and cross-country teams. His mom, Colleen, explained that the coaches were reluctant at first because they did not want to be held responsible if Bryant got lost during practice. Despite this they eventually relented, and Bryant was given the opportunity to join the teams. Bryant excelled and became a team leader. Never taking shortcuts during practice, he won multiple awards for hardest-working athlete. He proved his coaches made the right decision in allowing him on the team by placing at his first race. In doing so, he won the approval of his teammates, who would routinely defend him when anyone thought he was unworthy of being on the team. With this newfound confidence, he slowly began running full marathons, starting with the 1999 San Diego Rock ’n’ Roll. He finished in 4:36.37, averaging around 10:30 per mile. His next marathon came six years later in Portland, where he shaved more than an hour off his previous time to finish in 3:18.38 and average an impressive 7:30 per mile. From here, Bryant continued to improve. He ran his first of nine Boston Marathons in 2007. He ran a marathon annually for the next three years before stepping up his game in ’11 with three. He has continued this pace, with one exception, which was when he ran four in ’14: his fifth Boston, first New York City, and two more in Seattle. Even for races with a traditional course, weather plays a huge part in an athlete’s performance. Bryant has learned that his ideal running weather is when the temperature is in the 40s, cloudy, with a slight drizzle. With nine Bostons under his belt, it is a great place to compare times. Three of his top six times came when it was in the high 40s and low 50s. His all-time personal best of 2:55.23 came in 2013 when it was in the mid 50s. His worst times have all come with temperatures north of 60. After taking home gold and bronze at the USA Games, Bryant hopes to be selected to represent the United States in the Special Olympics World Games next July in Abu Dhabi, United Arab Emirates, and run his preferred event: the marathon. He also wants to run his first international race and is hoping to compete in the London, Berlin, and Tokyo marathons.